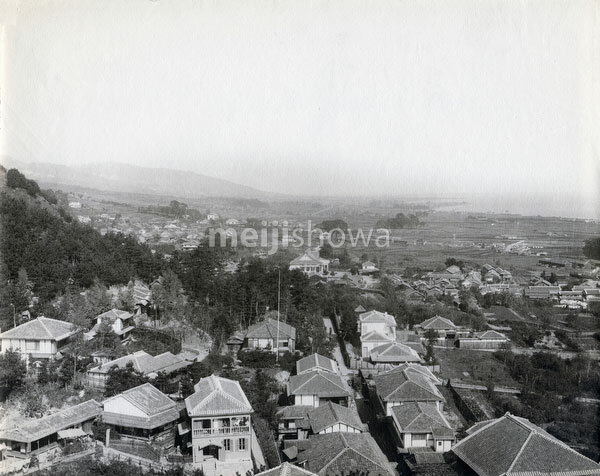 View from Mount Suwa (諏訪山), of eastern Kobe during the late 1870s, early 1880s. The road in the center is Yamamoto-dori (山本道), the small grove Jogaguchi Cemetery (城ケ口墓地). Behind it lies the residential district of Kitano-cho (北野町). The temple-like building in the center is the Jogaguchi Lecture Hall of the Jodo Sect Honganji Branch of Buddhism (浄土真宗本願寺派の城ケ口説教所). It was built in 1875 (Meiji 8) as a response to the popularity of Chrisitianity in Kobe. The first prefectural government meeting was held here on May 13, 1879 (Meiji 12). Also see 80302-0105-PP – View on Kobe and blog entry, Kobe 1870s • View from Mount Suwa.